We always said we wanted to take the kids to New York City when they were teenagers. We thought it would be best so they would have the energy to walk around all day and the maturity to appreciate the sights. 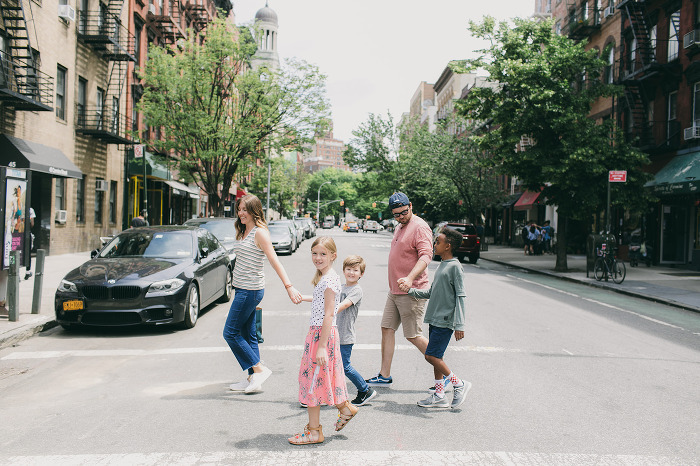 For the past few years, Andrew and I have been to the city a few times – just us – and every time we came home to rave about it to the kids. So we ended up with three kids under the age of 10 who dreamed about and talked about going to the big city one day. We didn’t plan to take the kids to NYC this soon, but when we decided to go to Montauk for our summer beach trip, we couldn’t imagine being that close to the city and not going, so we made it a nearly 2 week trip to fit it all in. YOLO. Chill Out. I’m sure Andrew wishes I took my own advice on this one! On day one, I was so focused on the logistics of meeting up with our moms, making it to our lunch reservations and checking off the sights on my list that I had to be reminded to chill out. Maybe reading these tips will keep you from getting TOLD on the streets of New York. You Can Come Back. Remember that whatever you don’t check off your list can be at the top of your list when you return. This isn’t a one shot deal. NYC is the kind of place you visit once and then immediately start planning your return trip. Eat off the Beaten Path. Most of the restaurants people recommend are in the touristy areas – and usually they’re fine. But we love venturing into the neighborhoods, where the locals live, to find the real food. The lines are shorter, it’s less expensive, and the food is better. Don’t Stay in Times Square. Times Square is a must-see but you’ll get your fill in about 15 minutes. If you love crowds and traffic, maybe this is your scene. We much prefer staying in Lower Manhattan and going uptown for the day to see the sights. The Hampton Inn in Soho was perfect for us. Choose a Budget Hotel. We like to stay in something a little nicer when it’s just the two of us, but you can’t beat a budget hotel that includes breakfast when you have a family of five to feed every morning. Besides the dollars you save on buying breakfast everyday, you save the time and energy of choosing and walking to a place to eat. It’s a win win. Full Exposure: The kids loved the trip, did even better than we expected and can’t wait to go back. HOWEVER, I just asked them the best place we’ve ever taken them to and two out of three said Kentucky Splash, a water park just an hour from our house. Look like our next NYC trip will be for the two of us, and they’ll get to return when they learn to give better answers to my questions. Sarah McAffry Inc. © 2016. All rights reserved. You may not take any images or content from this site without written permission.|ProPhoto Photographer Blog Design by Northfolk & Co.